In its Q3 earnings call, Tim Cook revealed a rather interesting statistic stating how many people currently beta testing its software. Apple’s new software is due for release this fall and it includes iOS 12, macOS Mojave, tvOS 12 and watchOS 5. Currently the software is in beta and is available for registered developers to test out. However, through the Beta Software Program initiative, normals out there can go ahead and give iOS 12, macOS Mojave and tvOS 12 a spin absolutely free as well – watchOS 5 is not included in the public beta initiative. This means that the horizon for testing out Apple’s software is rather vast, thanks to the wide support which Apple is providing in its hardware lineup. For example, anyone with a device that can run iOS 11 can go right ahead and try out iOS 12 Public Beta for free. The interesting thing to note here is that Tim Cook revealed that currently four million people are testing out Apple’s upcoming software lineup. The only downside to this news is that the CEO did not went ahead to reveal the exact breakdown of which software is being used the most out in the field. But if we are to take a wild guess, then it wouldn’t be surprising if iOS 12 tops the list of the software being more tested out there in the wild. Again, it’s just a wild guess, so take it with a pinch of salt. 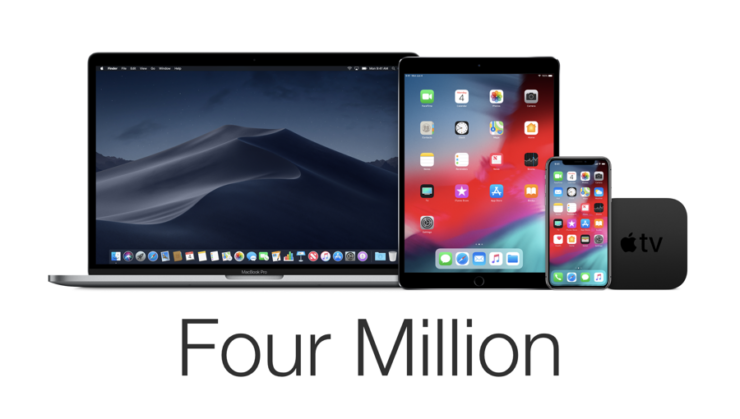 This news is an extremely big deal for Apple as it gives the company a huge base of users who are filing bug reports and ensure that the final shipping firmware is as rock solid as possible. Though nothing is always perfect still. Take an example of iOS 11’s launch for instance. It was marred with a handful of bugs despite being tested vigorously out in the wild. Let’s just hope Apple gets its software act absolutely perfect this time around.